08:00 AM pick up to your hotel. Drive to Inwa and sightseeing in Old Teak Wooden Bagaya Monastery, Maha Aungmye Bonezan Monastery, Nan Myint watch tower. 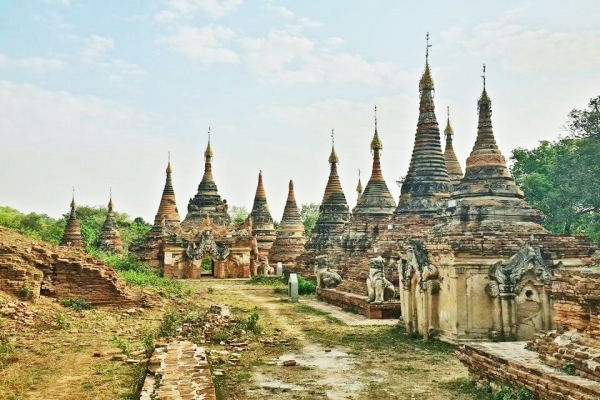 Keep going to Sagaing and sightseeing in U Min Thonze, Ywahtaung Village,Explore to silver workers produces bowls and other silver items by traditional methods Soon Oo Pon Nya Shin Pagoda. On the way back, you can enjoy the sunset from the famous U Bein Bridge. 18:00PM end tour and return to your hotel. Sightseeing Program in Mandalay-Amarapura-Ava-Sagaing with English Speaking Guide. Horse Cart and ferry boat sightseeing in (AVA).